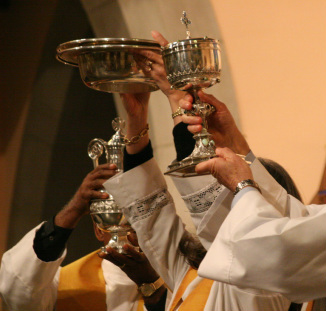 The Trinity Cathedral Altar Guild cares for the altars, vestments, vessels, and linens used in the services. They are a welcoming presence at the cathedral and diocesan events. They maintain an orderly, peaceful, atmosphere in the sacristies, strive to assure that supplies are on hand at all times for services and general uses, and share from our treasures as requested by our Bishop. Most of all, the Altar Guild prays for each other and for those who worship with us, that all may be done to God’s glory. Gratitude abounds for those who competently and gladly take care of our various services. Our Deacons, Carol Gilbert and Chris Cox, set up for the 8:00 am service in All Saints' Chapel, while parishioner volunteers put the arrays away after that service. Parishioners also arrive early Sunday mornings to arrange for the 10:30 am Eucharist in the Cathedral. Thus worshipers find all in readiness when they come in to pray. Dean John and our Priest Associate - Marilyn Adams, Noel Amadi, Shawn Armington, and Peter Bridge - are wonderfully helpful. The Rev. Arthur Powell, Rector of St. James, Yardville, is the Chairperson of the Diocesan Liturgy and Music Commission; he and his team help to make sure all those services held here are well-designed and go smoothly. New members are always welcome. Even if you are merely curious, please stop by and we will show you around the sacristies. Your help will be warmly welcomed, especially at diocesan events which are often held during the week and on weekends.